The Highways Agency intends to equip an English motorway to test wireless charging of moving electric cars. The Highways Agency (HA) has yet to give details of the trial site or dates. But it has issued criteria for system adoption, including a lifecycle comparable to that of asphalt (typically around 16 years), cost-effective maintenance, resistance to vibration and weather, and efficient charge collection at high speeds. Static inductive charging experience to date in the UK involves test cars parking at existing plug-in stations in London and an electric bus service launched in January 2014 in Milton Keynes, where vehicles top up their overnight charge during drivers’ rest breaks. Managing this five-year demonstration is the eFleet Integrated Service joint venture between Mitsui Europe and consulting engineers Arup. Arup helped create a wireless power transfer system branded HALO in Auckland, New Zealand in 2010. US wireless technology developer Qualcomm, which bought HALO in 2011, is running the London static car trial and planning a dynamic test track in Auckland. For operational experience, the HA can look to Asia, where the Korea Advanced Institute of Science and Technology (KAIST) is running two online electric vehicle (OLEV) buses on a 12km continuous charging route in the city of Gumi. It claims 85 per cent maximum efficiency in power transfer. The HA will also be monitoring the semi-dynamic charging trial highlighted by Transport Scotland chief executive David Middleton at a Chartered Institute of Highways & Transportation conference in March 2014. A halfway house between static and dynamic technologies, it will enable a hybrid bus to pick up charge from a series of modules installed under the road surface at strategic points along the route so it can run for long periods in fully electric mode. A Transport Scotland spokesman explains that the approach “is likely to cause less disruption than, for example, installing dynamic charging along the length of a road”. 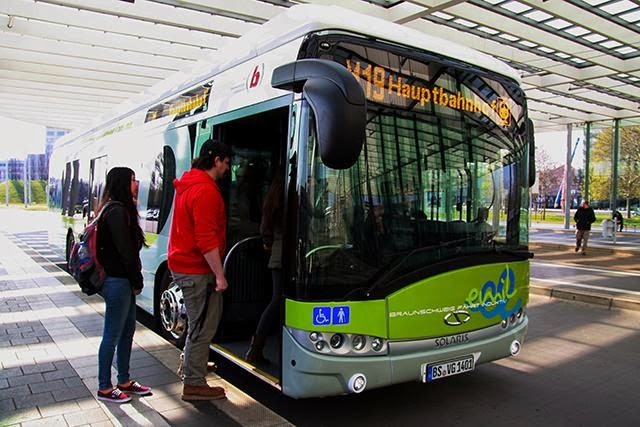 A similar technique is being used in Braunschweig, Germany, where a bus fitted with Bombardier Primove fast-charge technology went into passenger service on 27 March.